I've reviewed a LOT of Indy product this last year. For the fan of the movies, it's certainly been a banner year for various collectibles in every style and every price range. Some have been great, some not so good. Oddly enough, with all this product the one area seemingly slighted has been sixth scale action figures. It's even odder when you consider that everyone and their brother's cousin announced they'd be doing figures in that scale - Hasbro, Sideshow, Medicom, even Takara. And yet the releases have been a bit slow in coming. Hasbro produced one wave of four figures, and just finally released the Dovechenko figure as well. 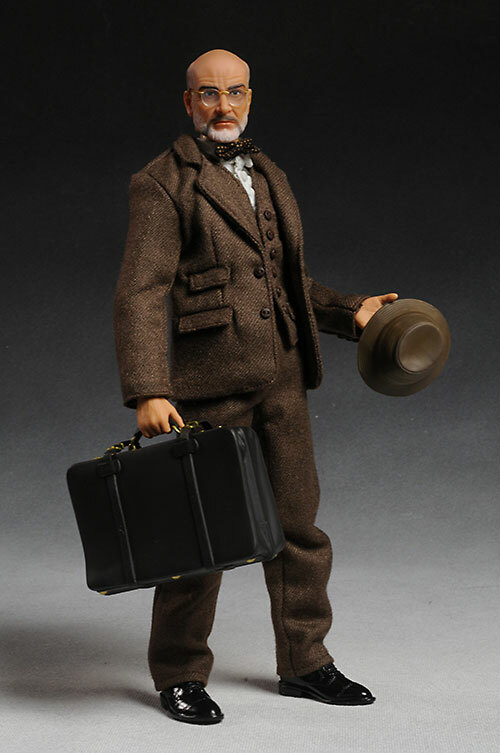 Sideshow has yet to release their Indy, and have only announced one other figure so far. And now it looks like Takara may be putting their ultra expensive version on indefinite hold. 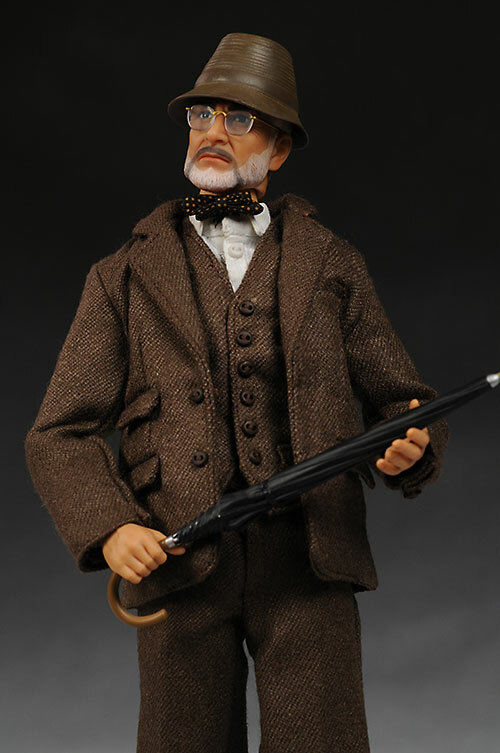 But Medicom has started to come through, releasing their Indy earlier this month, and now their Professor Henry Jones Sr. I didn't buy their Indy, as I think (hope) that Sideshow's will be enough for me. 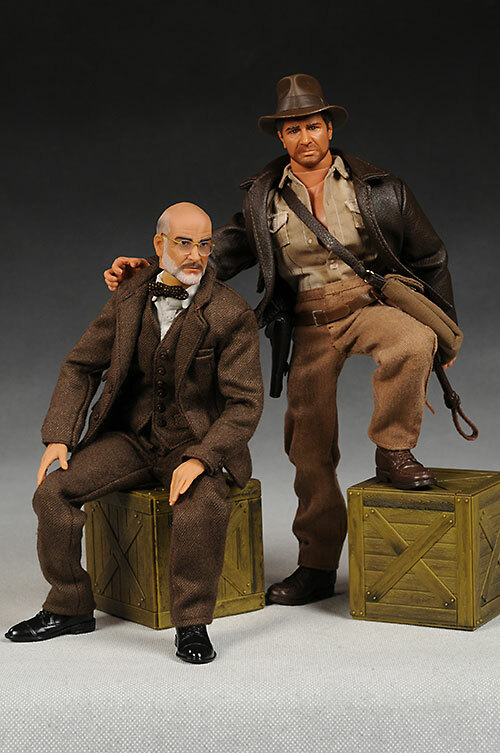 But with the slow announcement of any other figures coming out of Sideshow, as well as the excellent appearance of both the Henry Sr. and Young Indy in pre-production photos, I figured I'd better pick those two up to ensure I had a nice version in my collection. This guy is available through a number of online retailers (please see my Where to Buy section below for details) for anywhere from $135 - $150, depending on the retailer. Medicom does great packages, although they still trail when it comes to providing background text and information. The package is completely collector friendly, with no twisties or other annoying ties. It's all easy to take out, easy to put back, and no damage is necessary. They opted to go with an actual photo of the character for their front graphic, rather than a photo of the figure inside. This is always a gutsy move on the part of the manufacturer. Why? Because it provides the buyer with an actual reference point other than their (usually faulty) memory. When a company does that, it usually means they're pretty confident in the quality of the figure. I have never been a proponent of Medicom's 'human' sculpts. Characters that are alien in appearance, or wear armor, or wear masks are generally top notch, but they're human likenesses tend to have a bit too much caricature or manga in them for my tastes. That's not the case with this Henry. They've nailed the Sean Connery/Henry Jones Sr. likeness to the wall. In person, it's a fantastic facsimile. In photos, you will pick out a few flaws. The eyes are a smidge big still, but they certainly don't have the Speed Racer look. The skin isn't quite textured enough to have quite as much realism as say, the recent Hot Toys figures, but these are issues that require a very close inspection. There is some wonderful detail in the facial hair, and the more major age wrinkles are just about perfect. The glasses are also as close to perfect as I've ever seen in this scale. Some folks may not find the stoic expression to their liking, since Henry tended to smile a whole lot more than his son. But I have no complaints about the sterner look. He comes with an open gesturing pair of hands on his body, and a swappable set that includes a gripping right hand and another slightly different gesturing left. These are in scale, if a bit soft in detail. I could mention his shoes here or in the Outfit section, but I think I'll roll them up with the rest of the sculpt. I love the look of his high gloss black shoes, with both an excellent sculpt and proper scale. They are big enough to keep him standing, and yet they look proper in relation to the rest of his body. Shoes can be tricky, but these look great. I have a few nits I'll pick with the paint, but the bottom line is that it's extremely well done. The eyes and eyebrows look just about perfect, and some folks will be happy to see no catch lights added with the paint. The cast skin tone is even and realistic, and the hands and head match fairly well. The beard work isn't quite as nice as what we just saw with the Clone Ob-wan or the Alien Dallas, but it's damn close. There's a little over spray on the chin, but you won't notice it in person without a very keen eye. Great paint makes a great sculpt all the more better - Medicom did a great job in both categories. This is the Medicom RAH body, and if you've bought one before you won't get any surprises here. While this isn't my number one sixth scale body on the market right now - that honor belongs to the Hot Toys TrueType - there's no denying that the posability the RAH is top notch. I had no trouble putting him in natural, relaxed poses. The flow of the RAH, especially in the torso and hips, allows for very realistic stances. All the joints you'd expect are here, and some (like the ball jointed neck) are well above average in their range of movement and posability. There are three reasons the body isn't my favorite, however. One is the wrist pegs. While the wrists turn and move forward and back, there's no side to side movement possible. The second is the ugly head/neck joint. You can hide it on this figure in photos, but in person the way the head is squared off over the neck really stands out. Finally, there's simply the size. 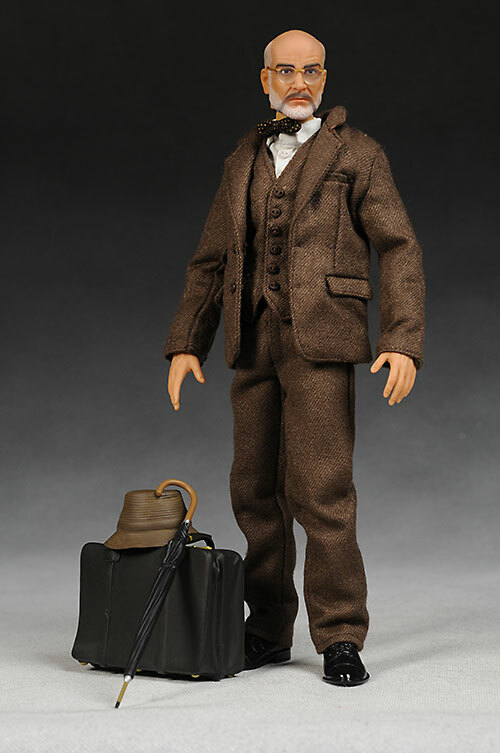 I was really hoping that this figure would fit in with my Sideshow Indy, but that's not looking like a good possibility. Henry Sr. only stands 11 1/4 inches tall, and this shorter height translates (as you would assume it would) into an overall smaller frame, taking up less volume. It's this less volume issue more than just the simple height that will make him look odd standing next to the SS Indy. 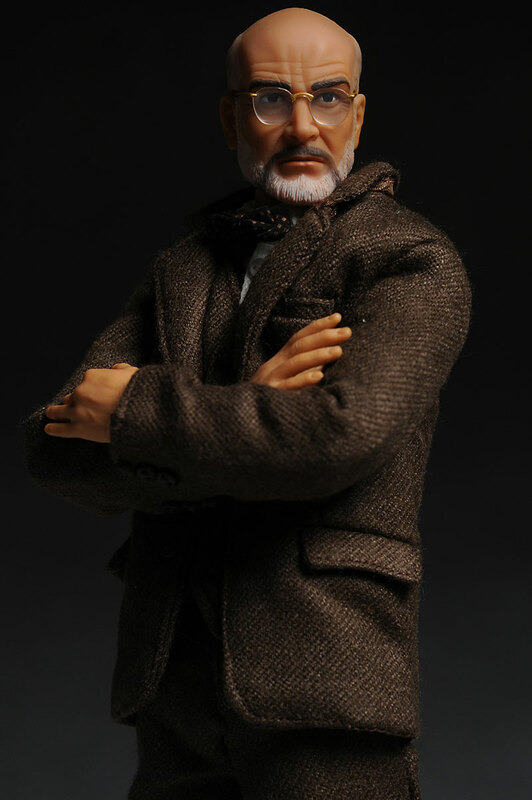 In fact, this reason alone is why he loses a half star in this category for me, and if a) you're sticking with just the Medicom Indy figures or b) you don't mind him being that much smaller than other 12" figures in your display, then you can give this figure the full four stars in this category. This is where the figure has the most issues for me. You have to keep in mind that this is a $135 - $150 figure, and for that kind of bank, the expectation around accessories is quite high. 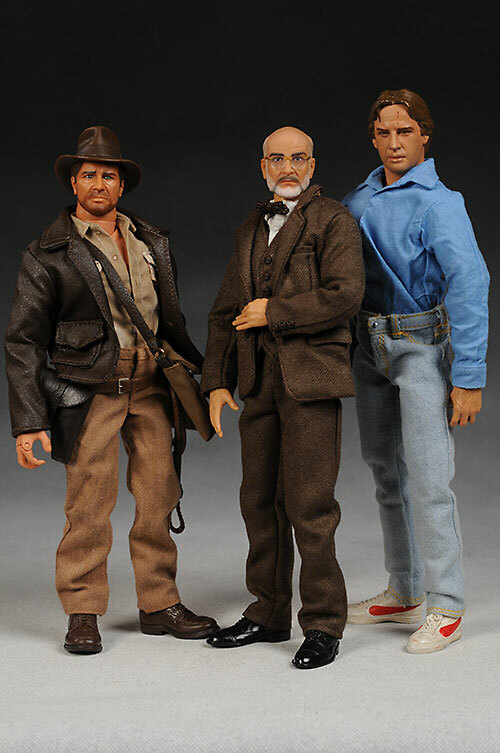 Dr. Jones comes with an extra set of hands, pretty much a requirement for any high end sixth scale figure these days. The hands pop on and off smoothly enough, and there's no flimsy feel to the pegs. He also has his umbrella, hat and suitcase. These are the most sensible inclusions of course, but the quality of them is not what you'd expect at this price point. The umbrella is simply a solid plastic piece, while the case is a softer, slightly rubbery hollow container. The sculpt and paint aren't bad, but the overall quality is pretty much on par with what we saw with the far cheaper Kotobukiya statue. Then there's the hat. It fits on the head well enough, and you can have it tilted back if you'd like. When I first shot most of the hat wearing photos, I had it down on his forehead, and I like that quite a bet better from the aspect of how the hat itself looks on his head. However, that's not how he wore it, and so I reshot most of them with it tilted back to fit the character appearance better. The color seems off to me as well, and if it looks off to me, then it must be really off. I think it should have had a darker, almost grayish look to it, and certainly not this light brown. In fact, it's lighter in color than his suit. The sculpt is a bit soft as well, lacking some of the details that you'd expect to set it apart. They did correct the scale a bit though since the early photos, and it does appear to be about the right size. In the end though, these few accessories don't have the quality or number for a figure in this price range. The inclusion of the diary, or even a seagull (like Koto's) would have been greatly appreciated. The outfit, for purposes of my discussion, consists of his shirt, vest, jacket, pants, tie, and socks. Let's start with the socks. Yep, they fit, they're there, but you'll never see them unless you strip him down. Nice to have, but not critical stuff. Let's jump up to the other small item, the tie. It's a little oversized, and it tends to ride up on his neck due to the snap in the shirt collar, but I can live with both of those issues. Ties, like glasses, are notoriously difficult to do in sixth scale, and when you get one that's reasonably close, consider it a blessing. You'll never guess what the best part of the outfit is...the shirt! This is a very accurate representation of a specific style of dress shirt, with very fine textured stripes running up and down. I have no idea where they came up with this material, but it was really quite a pleasant surprise. Other aspects of the shirt are also solid, with decent scaled buttons and collar, and snaps to hold it closed. The jacket and vest are made from a very high quality tweed, with a nicely scaled pattern as well. However, the material tends to be fairly thick, making the coat a bit ill fitting, particularly around the collar. It's not horrendous, and with a little futzing it gets better (and perhaps with a little stuffing to fill out his frame a bit more), but it's a minor appearance issue right out of the box. My biggest problem with the vest revolves around the closures they've used. Rather than go with snaps, they've opted for the cheaper hooks that slip into a thread loop on the other side. These tend to have more problems long term, particularly with the threads breaking. I did want to mention that the large pockets on outside of the jacket are actually pockets with linings, not just holes in the material. That's the kind of attention to detail that you expect at this price point on every aspect of the figure. While this category won't have any effect on my personal Overall score, I thought it important to point out that this figure really isn't designed to handle real play. That's mostly due to the fragile glasses, which wouldn't last 5 minutes with your average 8 year old. If you're looking for sixth scale figures for the kids, stick with the Hasbro offerings. This figure will cost you at least $135 right now at regular retail. If you buy it from Sideshow like I did, it runs you $150. The simple fact is that this is not a figure worth that kind of green. The head sculpt and paint are excellent, but there's nothing else about this figure that makes it stand out from figures in the $80 - $100 range. It probably doesn't help that as I was shooting this figure, I was shooting the Hot Toys Kane and Dallas figures as well. These two figures, with very complex outfits, excellent realistic sculpts and paint, plenty of accessories, AND light up features cost the same as poor Henry here. With the kind of quality being delivered by other companies right now, Medicom will have to find a way to either provide more value at this price point, or they're going to have to get that price point down to around $100 to compete. Be EXTREMELY careful with the glasses. They are glued in place, or at least it appears that way. They are so thin and fragile that I'm not willing to pull hard on them to find out! The perfectly scaled specs come with the price of fragility. 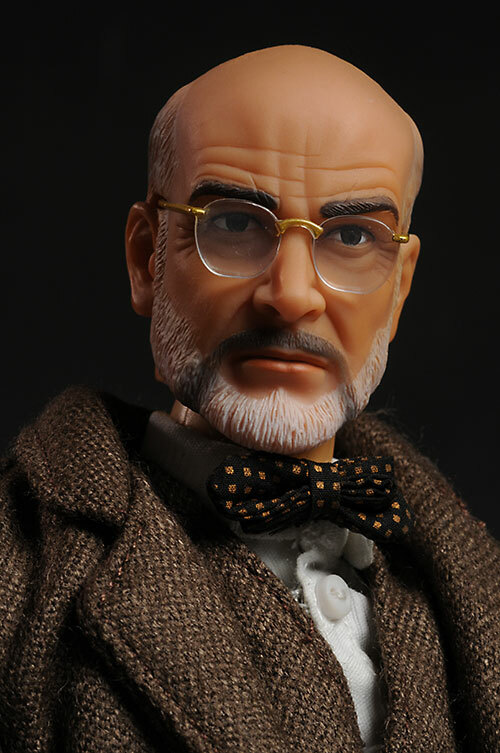 This is an extremely nice looking feature, sporting one of Medicom's best human likenesses. While I have a fair number of smaller nits, I could overlook most of them if this wasn't such a high priced collectible. They needed to counter the high price tag with more and better accessories, or they need to get that price down closer to the competition. However, if money is no object for you, you won't be disappointed in this figure. If Sideshow doesn't get around to producing a great Henry, then I'll be putting this guy in the motorcycle sidecar in my display permanently. 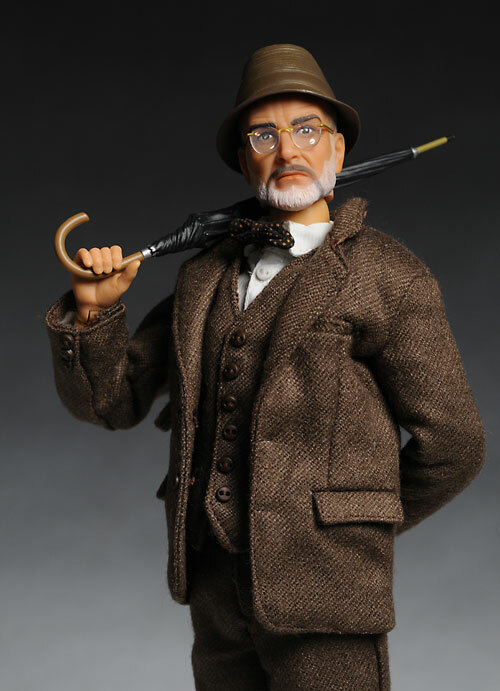 - CornerStoreComics has a 15% off coupon right now (HURRAH) for any instick item, which includes Dr. Jones Sr. That gets the figure down to about $115 - much, much better. 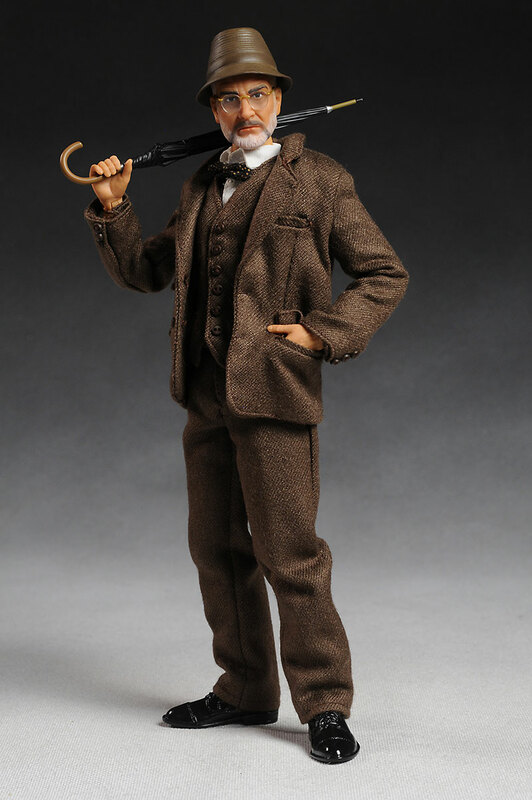 - Dark Shadow Collectibles has him (as well as Mutt, Indy and Young Indy) for $135 each. - Alter Ego Comics has all of them as well for $135. - or you can also search ebay using the sponsor MyAuctionLinks.com. - one of my favorite new Indy collectibles is the Mighty Muggs from Hasbro, and I've reviewed waves 1, and 2. - for the sixth scale collectors, I recently checked out the Hasbro mail away Ark. - on the cute side, check out the Adventure Heroes. 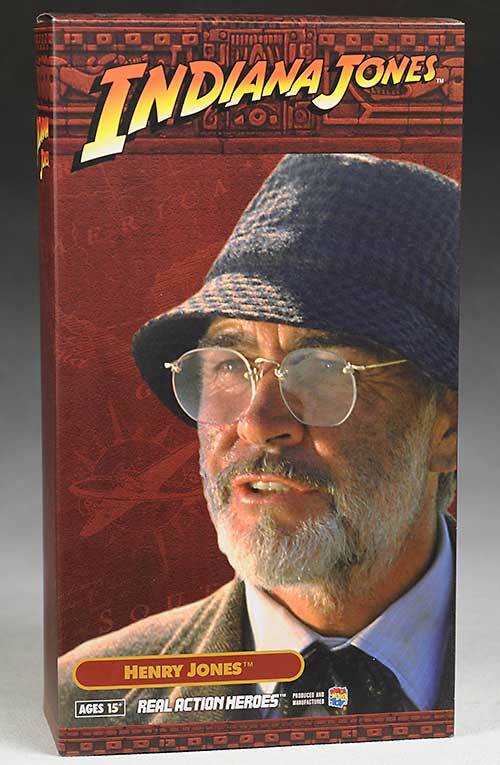 - then there's the Kotobukiya Indy and Professor Jones Sr, the Blockbuster exclusive DVD case, the 12" German and Cairo Swordsman, as well as both 12" Hasbro Indy's. - in the smaller scale, I looked at some of the deluxe two packs and several of the single pack figures, with a few more over at QSE. - There's a number of cool Lego sets, including this one. - Gentle Giant did a 7" version for the Disney parks. 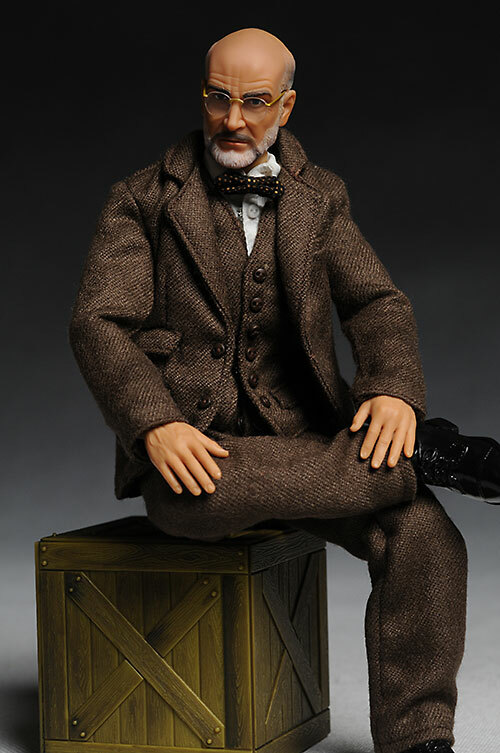 - Disney has done a few other Indy figures, including this wave of small ones. 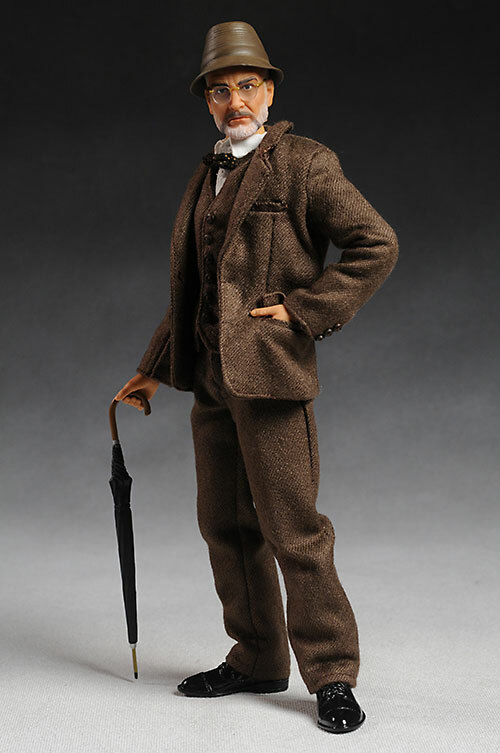 - and if you're looking for something a bit bigger, check out the very cool sixth scale Grail diary, or this sixth scale figure.